Before you begin your corporate e-learning course, it’s essential to first stop and ask, “How ready is my content?” The state of your content, or your “content readiness,” impacts your project plan, resource needs, and, yes, your project budget. And unstable content can create a ripple effect that could cost you additional dollars for changes later in the project. Not to worry, though—we’ve got you covered with a free, downloadable Content Readiness Assessment Tool, along with these great tips from solution architect Erin Krebs and instructional design practice lead Catherine Davis. Are you now wondering, “How do I know how ready my content is?” Bravo! That’s the right question and the one we hope to shed some light on for you in this article. Having worked with many, many clients to frame up and launch new corporate e-learning courses, we know there can be some gray area around client-provided content availability and stability for training materials. To help you get started, read on for definitions, and budgeting and other considerations that emphasize the importance of understanding your content readiness. Best of all, we’ve created a free, downloadable Content Readiness Assessment Tool for you to use on future corporate e-learning projects. The readiness and documentation of course content are important factors in determining the cost and duration of a corporate e-learning project. They are also essential parts of the project scope, and they should be documented as assumptions in the project statement of work or charter. In our experience, clients often will overestimate how well documented and stable their content is during project scoping. So, we use the e-learning project scoping phase as an opportunity to “get on the same page” with our clients about their content by clearly defining what we mean by content readiness. Content stability refers to the likeliness that content will not change during design and development. Consider these two scenarios. Client A is developing a compliance course on Equal Employment Opportunity and has pre-existing content based on current laws. The laws are not in question or likely to change for the next year. We can assume that this content is stable and not likely to change during the development process. Client B is developing a new hire onboarding program for managers and wants to include an overview of the corporate strategy. In a month or so, executives are attending a retreat where they plan to hash out aspects of that strategy. In this case, there is a strong likelihood that content will change during development; therefore, it’s less stable. If the content is less stable than originally estimated, additional scope may need to be added to the project to cover content changes that come up during development. It’s important to note that we are looking at the stability of the content through the duration of the e-learning project. Many courses need content updates in the future, post-launch. If you know that a course will need content updates in the future, this is good information to have in project scoping, but it doesn’t affect content stability as we are defining it here. Content documentation refers to how well documented the content is when it is handed over to the vendor-partner development team. Consider these two scenarios in which we are converting an instructor-led training program to e-learning. Client A has content documented with PowerPoint® slides that include detailed instructor’s notes or a script along with student handouts. In this situation, the instructional designer (ID) can pull the majority of the text and narration script needed for the e-learning from the detailed instructor’s notes. Client B has content documented with PowerPoint slides, but no instructor’s notes are present OR there are high-level bullet points, but not a detailed script. In this case, the vendor-partner’s ID will work with subject matter experts (SMEs) to identify content and draft text and narrative for the e-learning. As you can imagine, the ID will spend more time on Client B’s e-learning project developing content. But what about SME time? Plan for more time for these resources on Client B’s project also, for interviews and reviews. How Does Content Readiness Impact Corporate E-learning Budgets? When you need to drive down costs for e-learning projects, consider the stability and documentation of your content. The more stable and well documented your content is prior to working with a vendor-partner, the more cost savings. During e-learning project scoping, we make some assumptions based on what we learn from our client about content readiness. These assumptions help us gauge the work effort and hence the budget, and they are a starting point for a deeper dialogue that will happen during the content review. In the chart above, “SME” stands for subject matter expert, or stakeholder, as the case may be. “ID” stands for instructional designer or vendor-partner. What has your experience been with content readiness? Are your or your clients’ estimates generally on target? How has content readiness, or lack thereof, affected your projects? Do you have tips for assessing content readiness? We’d love to hear from you in the comments. How Ready Is Your Content? 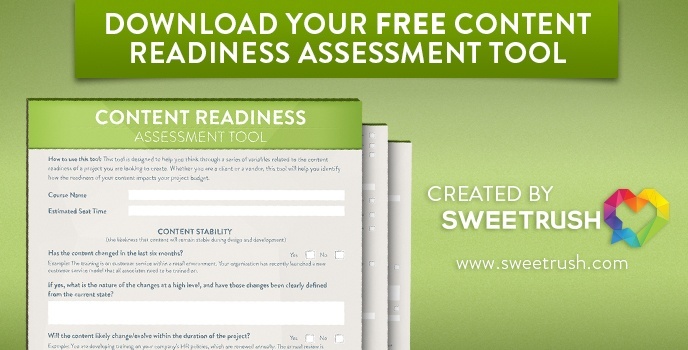 Download This Free Content Readiness Assessment Tool to Help You Evaluate. Expert tip: If you are working with a number of SMEs or stakeholders to evaluate the level of readiness, set up these questions in a tool like Google Consumer Surveys to help collect, organize, and analyze the results. Get more excellent tips from Erin on her blog page at SweetRush.com!